(Harry Elam Jr. 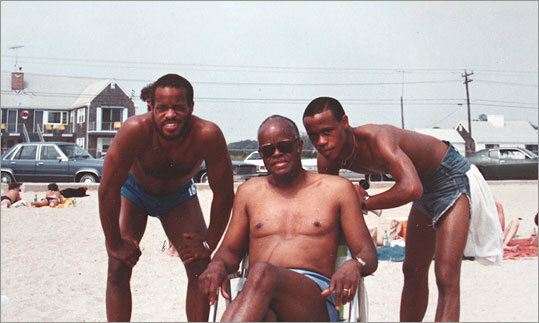 Photos) Harry Elam Jr., Harry Elam Sr., and Keith ("Guru'') Elam on Cape Cod in the 1970s. (EDITORS NOTE: Boston-born Keith Elam, who rose to fame as Guru, founder of the rap group Gang Starr and a person who sought to merge rap and jazz, died earlier this week. His brother, Harry, a distinguished professor of drama at Stanford, has written this remembrance). Positivity, thats how Im livin.. So goes the lyric from my brothers early hip-hop song, Positivity. My brother Keith Elam, the hip-hop artist known as GURUGifted Unlimited Rhymes Universaldied this week at the too-young age of 48 because of complications from cancer. Positivity was what he sought to bring to the music and to his life, and for me that will be a large part of his legacy. In February of this year, my brother went into a coma, and I traveled across the country from my home in California to see him. At his bedside, I stood and stared at his overly frail frame, his head that he had kept clean-shaven for the last 20 years uncommonly covered with hair, his body connected to a sea of tubes and wires. I listened to the whirl of machines around us and took his hand. As I did, my mind flashed back to now-distant times, so many memories. And I saw us as teenagers at the beach on Cape Cod playing in the water together. And I saw us as boys, driving to school. My brother was five years younger than me, so we attended the same school only for one year -- my senior year, his seventh-grade year -- at Noble and Greenough School, and I would often drive us both to school. Invariably, I made us late, yet my brother, never as stressed as me, was always impressively calm. At school he endured the jests and teasing from the other boys about being my little brother. I was president of the school and had charted a certain path at Nobles. But my brother found his own creative route at school, as he would throughout his life. His journey was never easy, never direct, but inventive. Through it all he remained fiercely determined with a clear and strong sense of self. Over the years I had proudly watched my brother perform in a wide variety of contexts. While at Nobles, we had a black theatre troupe known as the Family. In 1973, we put on a play entitled ''A Medal for Willie,'' by William Branch, and because he was only in the seventh grade, Keith played only a small role, but even then you could see his flair for performance, his comfort on the stage. At home, our older sister Patricia would teach him the latest dances, and he would execute them with verve as I watched from the sidelines, impressed with his moves, and not without a few twinges of jealousy since Ive always had two left feet. As a teenager he raced as a speed skater. I do not remember how he became involved in the sport; I only remember traveling with my family to watch his meets in the suburbs of Boston. I do not remember if he won or lost, I do know that he always competed with great ferocity and commitment. When he announced to me that he was dropping out of graduate school at the Fashion Institute of Technology to pursue a career in rap, I thought he was making a grave mistake and warned him against it. But as always he was determined, and in the end he would succeed beyond perhaps what even he had imagined. Early on in his rap journey, he visited me in Washington., D.C., over a Thanksgiving weekend. I was teaching at the University of Maryland then, and we went to what was perhaps the most dreadful party we had ever attended. As we hastened out the door, I apologized for bringing him to this party. My brother replied lets write a rap song about it, and we did. The lyrics made us laugh as we collaborated on the rhyme scheme and rode off into the D.C. night. It is one of my fondest memories, this spontaneous brotherly moment of collaboration and play. Back in 1993, when he played at Stanford University, I was in perhaps my third year as a professor there. As I walked into the auditorium that night, the assembled audience of students looked at me with a new awareness, thats the Gurus brother, not thats Professor Elam, but the Gurus brother. And I was, and am, the Gurus brother. I admired and loved him deeply, my little brother. And I was and am so proud of him, and how he made his dreams reality . And with the outpouring of love that has crowded my e-mail with his passing, I know that he touched so many with his music. My brother cared deeply about family. He raps of my parents in more than one song. They are featured on his video Ex girl to next girl. It was one thing seeing my brother on MTV; it was another seeing my parents. His son K.C. was the joy of his life. 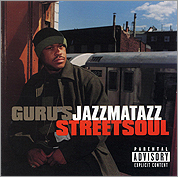 Keith Elam worked with a variety of artists on his acclaimed Jazzmatazz series of four albums, from 1993 to 2007.